The Amish settlement located at Kishacoquillas Valley in Pennsylvania is one of America’s oldest and arguably its most colorful, at least in a literal sense. 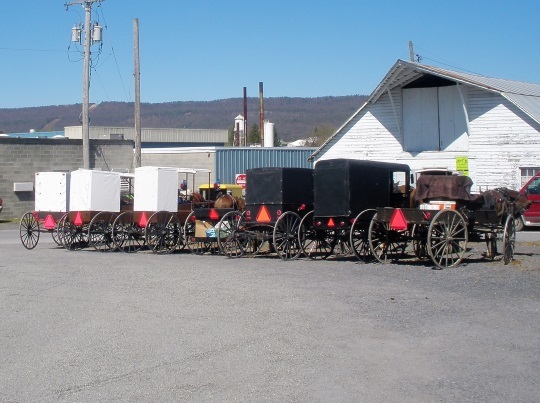 While it’s rather off the beaten path, found in central Pennsylvania about two hours from Lancaster County, this community is pretty well-known for its three main Amish affiliations, each of which uses a different-colored buggy top. 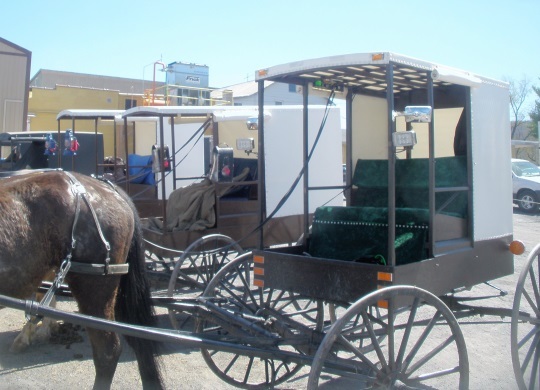 The Nebraska Amish can be recognized by their white-topped carriages, while the Renno people drive a black vehicle. Most unexpected of all are the buggies of the Byler Amish, coming in a vibrant lemon-yellow hue. Besides the superficial visual differences, these groups also differ in their degree of conservatism affecting things such as the technologies they accept. Reader Jerry, who last guest-posted about the popularity of dandelions as a food among Amish and Mennonites, is back to share some photos of his visit to the valley. 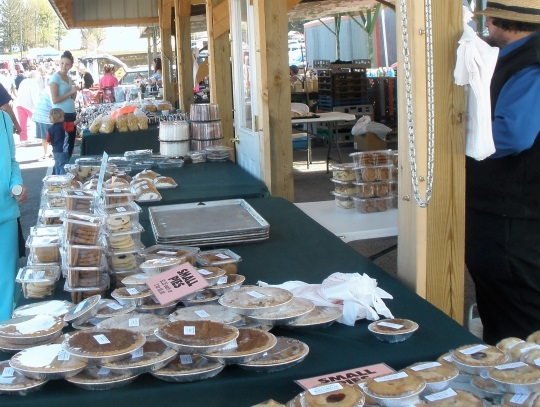 Today we look at the auction and market held in the town of Belleville each Wednesday, popular with Amish and non-Amish alike. This is the first of 3 posts we’ll have from Jerry on Big Valley, so stay tuned for more (or if you haven’t already, subscribe to make sure you get notified of new posts by email). It’s a weekly, in season market featuring several auctions for produce, large animals, poultry, hay and fire wood. A flea market runs most of the day. 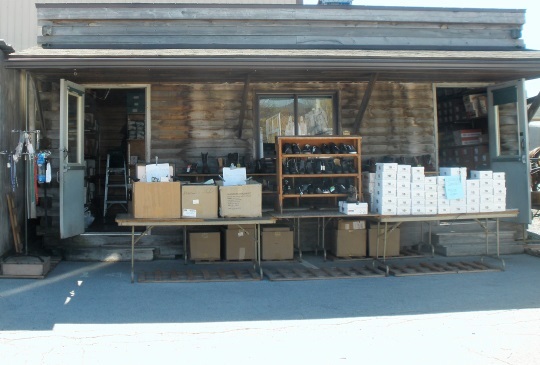 There are some permanent shops that sell shoes and baked goods. 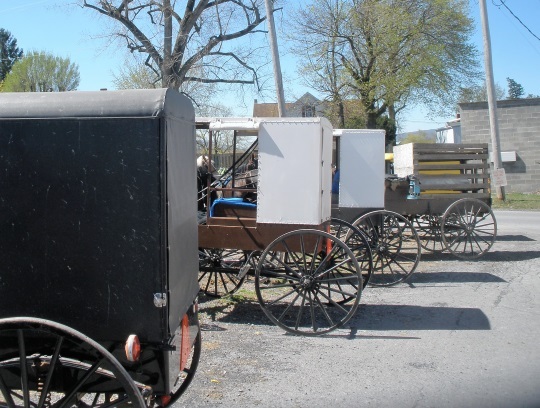 All three of the famous Amish buggies are found here along with some Old Order Mennonite buckboard wagons. The Big Valley is also home of the “one suspender”. Why have two when one will do. Note from Erik: This unusual custom is the norm among the Renno people (update: and Byler group). 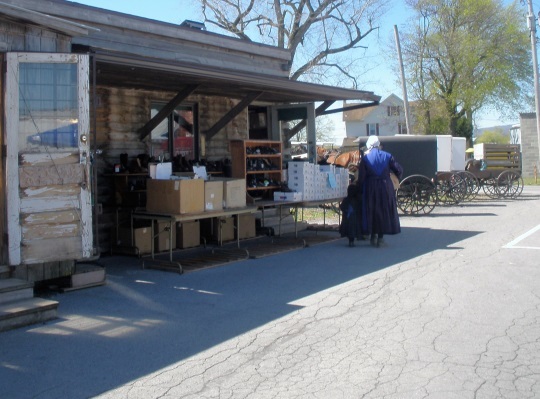 Most Amish buggies have batteries (12 volt car batteries) for lights, and many have LED lights. However some of the white toppers still support kerosene lanterns on the buggies (If you haven’t picked up by now, I love buggies and love to drive one when I’m allowed). Note from Erik: The above is the first evidence I’ve seen of Nebraska Amish using electric lighting on their vehicles. Though they are generally considered the most conservative of the three main affiliations, there are several sub-groups among Nebraska people, some of whom use cell phones. Also at the Belleville market, is the Peachy Butcher Shop. They sell freshly slaughtered meats and also offer to the Amish freezer lockers to rent. The renters can preserve food items there and make their own ice blocks in their own lockers. Interesting! A few notes… The single suspender is also worn by the two Amish groups that drive yellow buggies. (And yes, there are two separate groups.) 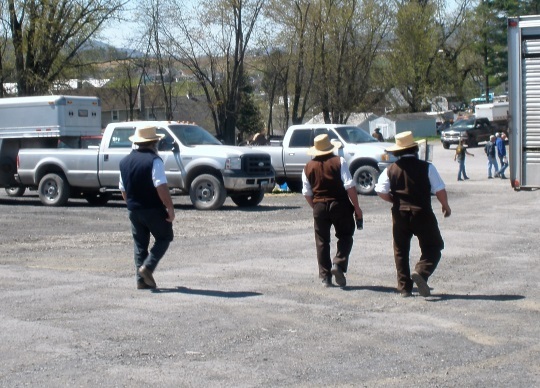 There are no Old Order Mennonites in Big Valley. 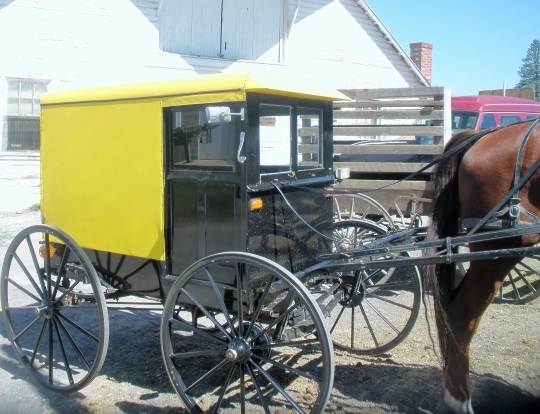 The black buckboards are driven by black & yellow top Amish; the brown version without a dashboard is used by the Nebraska Amish. There are 5 groups of Nebraska Amish. As far as I know, the Zook group is the only one to use battery lights on buggies, though I may be mistaken. Another group might possibly have adapted them as well, as we heard they were considering it after one of their members had not one but two bad buggy wrecks in less than a year’s time. Note also that black & yellow buggies have only one headlight, while the Nebraska group immediately adapted two. 🙂 They also use rear-view mirrors, which are not found on other Nebraska buggies. Thanks Mark! Updated/corrected the info above. Any idea when the Nebraska sub-group(s) adopted battery-powered buggy lights? I do not remember seeing any on my last visit (though it has been a couple years, and I didn’t go everywhere in the valley). The battery lights are fairly recent. About 5 years ago I had heard some had started using them, but I got the impression it was something that was mostly among the youth. A year ago when we visited relatives in Big Valley, we saw several of the Zook group with lights and were told they had now allowed them. That particular group is not very big and is scattered around the lower end of the Valley, so a visitor might not see a lot of them. Before they got the lights, that group had adapted colored reflectors as long as 20 years ago and some buggies were really souped up with reflectors. Thank you Mark, very interesting. Are there other groups of Amish in the Big Valley that are not Nebraska Amish? There are 8 groups of Amish in Big Valley — 5 Nebraska groups (white tops), 2 Byler groups (yellow-tops) and the Renno group (some might call them the Peachey group) with black-tops. So, yes, there are. There were formerly New Order Amish in Big Valley too, but they had some church trouble, and disbanded. Some moved to Ohio, and some joined the Holdeman Mennonites. This is fascinating! I was aware of the Nebraska Amish and other Amish in Big Valley, but I had no idea there were five different groups of Nebraska Amish. Do you know how long this has been true, Mark, and/or when the first split occurred? “The Amish of Big Valley” would be an interesting book, it sounds like. I live here and didn’t realize there were 5 groups just within the Nebraska Amish. In the valley we refer to the 3 groups as white toppers, yellow toppers or black toppers, noted by the color of their buggies. While they are alike in common ways, they are very different in other ways. Still all are very interesting and unique, and amazing how they have kept rooted in their traditions, even though they have adapted some modern conveniences like use of cellphones and battery operated tools, etc. Eric, you must stop by again! Last time I was working, but now my husband and I are retired, except for still running our bed and breakfast. Hope to see you on your next trip to the valley!! That’s something I didn’t know at first but learned some time ago, and became evident to me when I spent some time with cell-phone using members of a Nebraska church. In the past, Nebraska Amish have been described as among the most conservative, but that description may no longer be true or require more nuance than at one time. I have a similar question to Emily above, not sure when the splits originated. I do know someone who keeps close track of these things and maybe he could lend some insight. I’d love to drop in again, last time I was in Big Valley with a friend from Lancaster and we missed catching you in Claudia. Will be sure to try again on my next visit, I did enjoy seeing the B and B, it’s in a lovely location! Adding to the “variety” is the fact some members living in one community might actually have their church membership in a separate community. There are a few families in McClure who do not belong to either of the two groups there, so they make the 25 or so miles trip to Big Valley for church every other week. The Nebraska Amish are often called the most conservative of all, and two of the groups are very conservative, but a few are surprisingly progressive in material things, like the cell phones Erik mentioned and also gas fridges, freezers, lighting, and solar panels. Compared to the Swartzentrubers, all of the Nebraskas might be considered a bit more advanced in most areas. The conservative Nebraskas may not mow lawn, for example, but do hired drivers and work in pallet shops, swamills, and the like. I don’t know if I can/ should do this, but if you want to see nice photos of Nebraska Amish, check out Bill Coleman’s Gallery website. A very educational post, and I always appreciate your first person info, Mark! 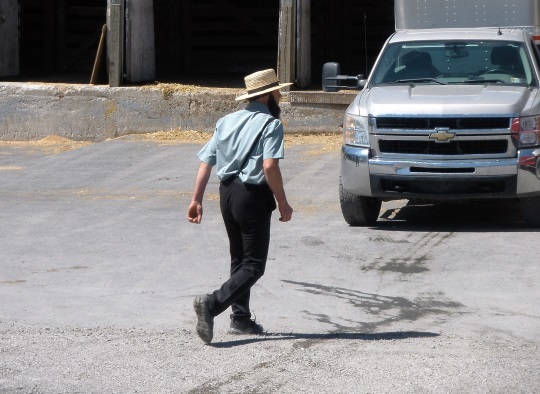 Would you or Erik have an idea of how many Amish (altogether) inhabit the Big Valley area? It SOUNDS well-populated! I do not have a current directory, but based on what I do know, I am going to say there are at least 28 and possibly as many as 30 church districts of Amish living in Big Valley. (That includes everyone no matter which Amish group they belong to.) This does not include neighboring valleys or communities, just Big Valley. As a chemical engineer I would recommend that all Amish carriages be structural modified with sturdy metal roofs; such that they can withstand Baseball size hailstones as these types of storms are occurring more frequently. Strong Metal roofs of different colors screwed to the top may be need as we are experiencing a 200 year weather cycle which can be deadly so be PREPARED FOR THE WORST> Over the past five years throughout the world the weather is changing due to a meteor that hit Siberia a few years ago and caused the jet streams to move differently and on top of that many drivers are DRUNK on the highways and are not Paying ATTENTION TO ANYTHING. SAFETY FIRST!!! Remember when George Washington crossed the Delaware River in 1776 there was a little ICE AGE. When Man was not on this EARTH, Dinosaurs roamed The North Pole and Alaska.